Unique Ferris wheel in China | All about CHINA. 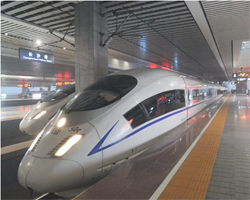 China with a great desire builds diverse and ambitious projects. The glass bridge was built, the greatest extent of the bridge cost, built the railway on the permafrost on the moon "jade rabbit" was launched, it is still something more ambitious going on. The country has a large cash capacity, money and desires in the country is equally much, that is why the Chinese are creating each year, something which no where in the World, thereby glorifying their homeland. Recently, the network appeared the news that in China on one of the highways between the road branches appeared compact, but fairly high Ferris wheel. No one would be on the news and did not pay attention, if not one "but". The construction company built a Ferris wheel at the extraordinary technology in the design not the usual steel I-beams in the image and likeness of a Bicycle wheel. All made completely different. The wheel display is called Bailang River Bridge Ferris Wheel and has a diameter of 145 metres. The cunning Chinese have created this unique attraction in Shandong province. There is something similar in Tokyo, the sample was copied and improved. The result turned out the Ferris wheel in height two times higher from the Japanese counterpart. Lockers in the Ferris wheel large each holds up to 10 people, all viewing booths 36. The cabins have free Internet connection, there are even screens for easy viewing. In 28 minutes wheel review makes a complete rotational cycle. Attraction is already working and visitors are very satisfied with it.